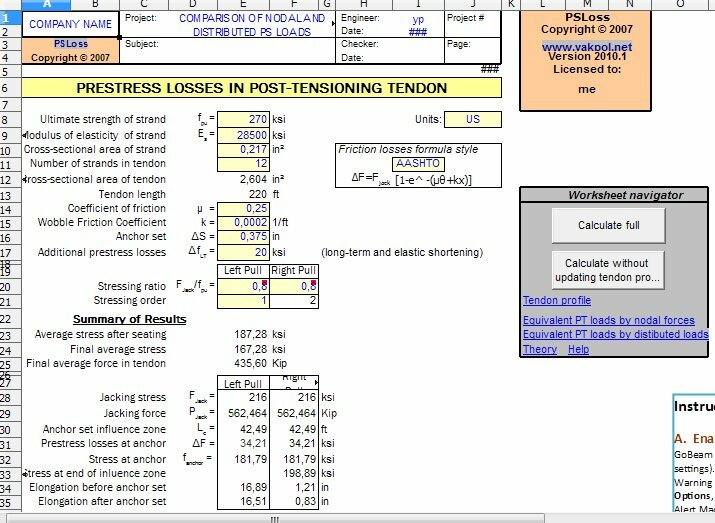 The spreadsheet calculates elongation, friction and anchor set losses of prestressing tendon. The tendon can have a three-dimensional profile and may be jacked from one or both ends. 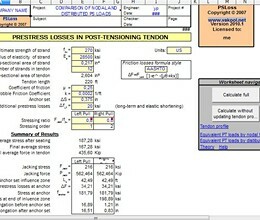 PSLoss assists in the development of a vertical tendon profile for multi-span beams. The spreadsheet provides dynamic graphics for easy visualization and verification of input data and computed results. It has been used successfully for a variety of bridge projects and has accurately checked post-tensioning shop drawings. * PSLoss download link provides trial version of the software. PSLoss has been rated 5.0 out of 5 points. A total of 1 votes cast and 0 users reviewed the software.